"I believe myself & my best friends, and you"
Kyuukumi new and old... Whether you call them アリス九號., Alice Nine, or A9, we're here for you! Welcome to alice_nine, the largest English-language, international Alice Nine/A9 fan community on Livejournal! Have you got a question about the band that you just haven't been able to get answered? Are you on the lookout for translations? Do you need a place to rant about how awesome that latest release was? You've come to the right place! Whether you call them アリス九號., Alice Nine, or A9, we're here for you! To see some of the posts here, you must have a Livejournal account and then join the community. 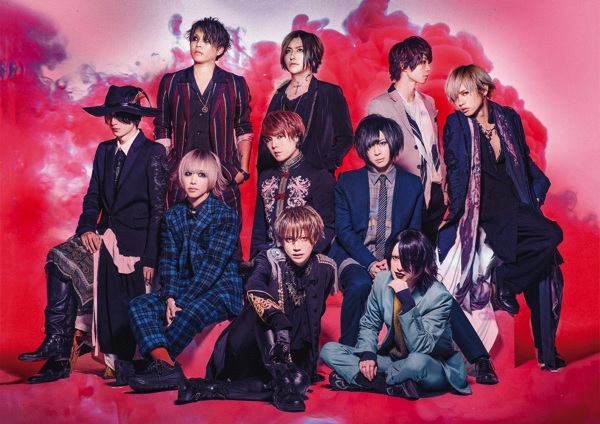 We love meeting new Kyuukumi (A9 fans) so don't hesitate to introduce yourself once you become a member and you can even take a few minutes to read others' introductions. If you'd rather not create an account to join the community, you can still comment anonymously on most entries... but it's more fun if you join us! Please read the rules on the [ profile page ] before you do any posting or commenting. Thanks! You can get many of A9's releases on itunes, Apple Music, or Spotify (here/here/here). If you are unable to buy the physical releases, please support them through listening to legal streaming/digital options! Introductory Post : Check back now and again to see the introductions of new members! This is a "sticky post", so it will always be the top entry on this community. If you have any questions about how to join, some suggestions for the community, see some rule-breaking, or a problem on the community, please leave a comment to this entry. All comments are screened, which means only I, a friendly moderator, will be able to see them. You can also send me a direct message. Live Broadcast : 2019.04.23 : Show live on Mujinyan Mate! However, please note that part of the broadcast on either site will be for paying viewers only, so after a certain point, you will no longer be able to watch. On FRESH LIVE, you will need to pay a monthly fee of 360JPY, and on the FOOL'S MATE channel (through NICONICO) it would be 324JPY per month. This also means that if you don't watch the broadcast live, you probably won't be able to view a timeshifted copy after the broadcast has finished airing. So if you really want to see it, and aren't able to get a membership on either site, make sure you watch it live! 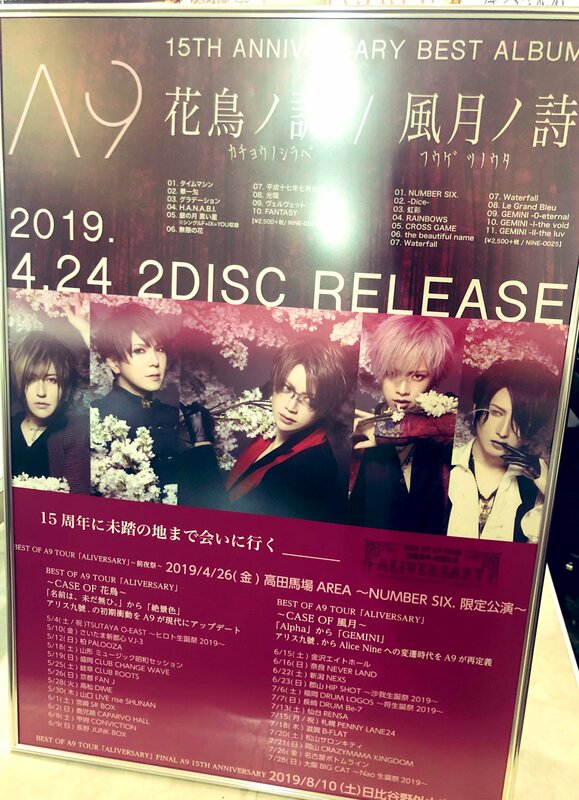 The release of the 2-part BEST OF album (kachou no shirabe // fuugetsu no uta) is less than a week away (April 24th)! There's still time to preorder physical copies online through CDJapan (KnS / FnU), HMV (KnS / FnU), or Amazon (KnS / FnU) etc... otherwise, get the digital versions through itunes, apple music or Spotify starting from release day! If you buy both versions of the album at the same time from the same store, you will be given an "Outstore Event" ticket, which can be used after any of the associated live tour performances (listed in the poster at the end of this entry) in order to access an autograph and short talk session. CDJapan and HMV are participating in this bonus, but Amazon is not, so keep that in mind if the bonus ticket interests you! You'll need to check with store pages beforehand to make sure they're participating in that bonus offer and still have them in stock. The two band members in attendance changes according to each live performance (much like last year's similar event), and you can check THIS page on their OHP for more information, including which CD/DVDs are eligible for signing. If you have any questions about this particular event, please don't hesitate to leave me a comment below and I'll do my best to answer! For anyone not on Twitter, and who hasn't checked out the teaser videos yet, take a look at the teaser for each album below! 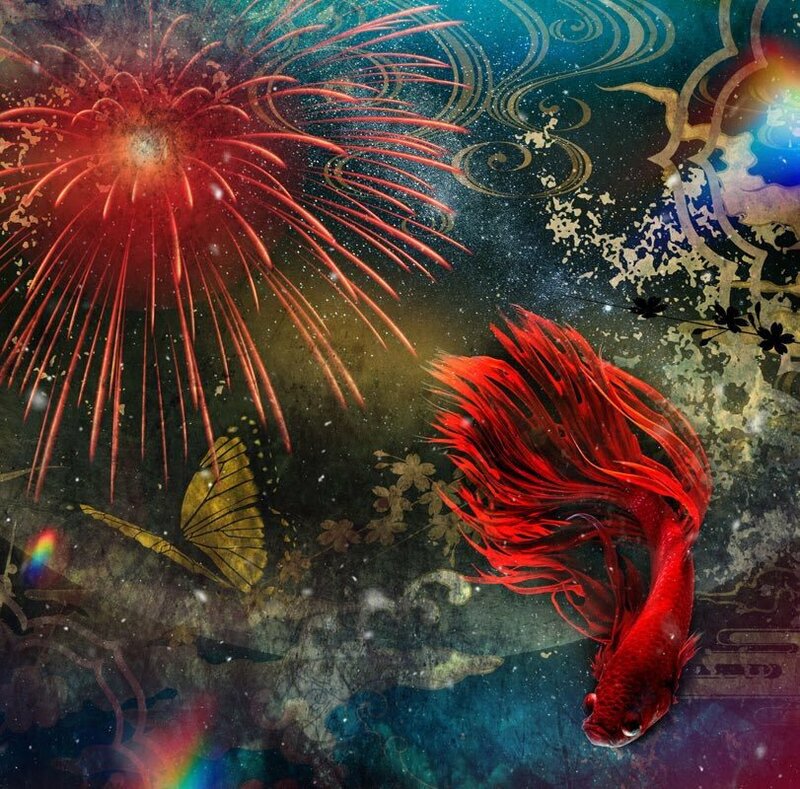 I've only listened to the preview for kachou no shirabe (I really don't want any spoilers for the songs on fuugetsu no uta before I can listen in full :p ), but the rearrangements sound amazing... true to the original songs and yet wonderfully new. I can't wait to hear everything in full. I hope everyone else is hyped up! 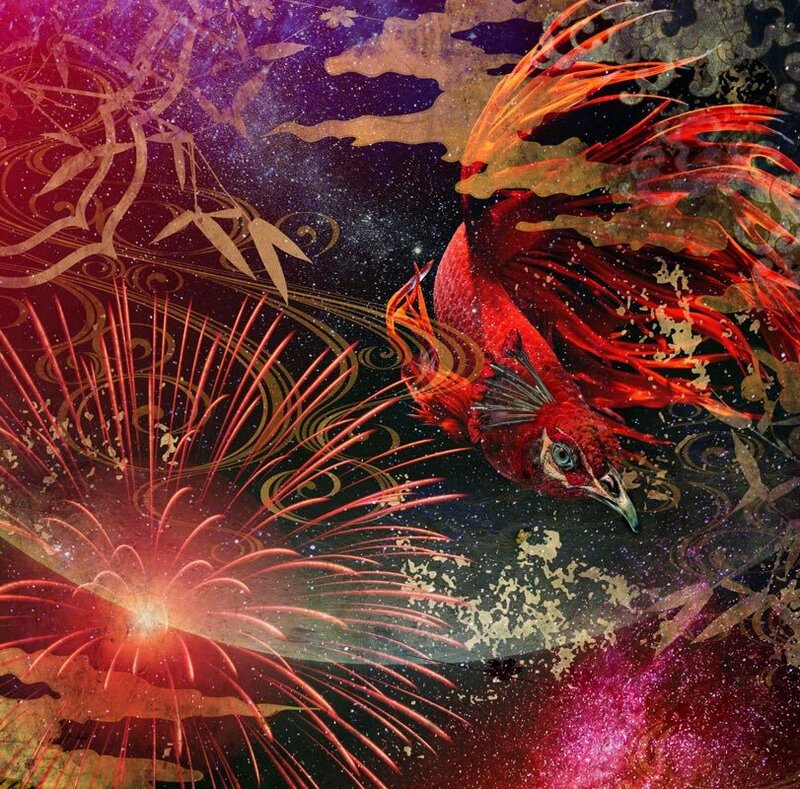 The art for the regular editions of the album has been unveiled (check out THIS post for the limited edition album art), and man... it is absolutely beautiful. You're gonna want to click on each preview image to admire all the details in the full-size versions. 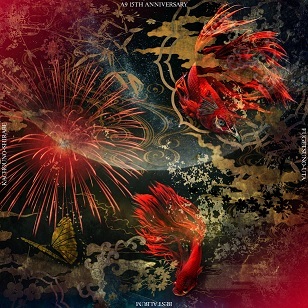 In addition, CD shops have tweeted images of the new promo poster for the album release and associated "ALIVERSARY" tour, which includes another glimpse of their new look. Click on the image below to see it full-size. I know it's two weeks late D: but I hope you enjoy it! 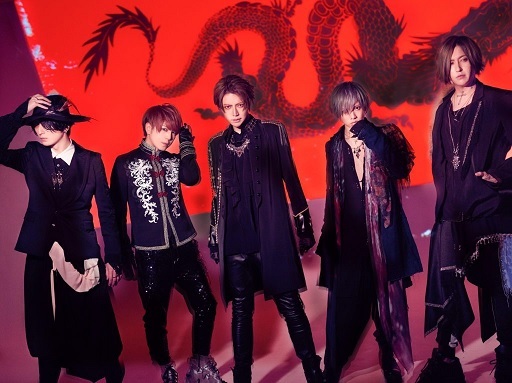 A9 have announced a NicoNico live broadcast on March 15th (this Friday) to jumpstart their upcoming 2MAN tour with BugLug (A9 vs BugLug 2MAN TOUR : Noroshi-TOO FAST TO LIVE TOO YOUNG TO DIE-) which will begin on the 21st of March. You can check out all the information on [ this site ], but I've copied the tour dates below, anyway. The NicoNico broadcast page is [ HERE ] so don't forget to tune in if you can, or timeshift it to be able to watch it later! All members of both bands will be in attendance. Again, the [ NicoNico Live Broadcast ] is on the 15th of March! The limited edition of the upcoming albums has been unveiled, and will be available for preorder on A9's online shop (MAD - preorder page) from the 3rd of March to the 20th of March. The only catch is that you must be a Fan Club member in order to buy a copy -- but as long as you join within the above time-frame, you will be eligible to place a preorder of the limited edition. If you are not sure how to join the FC, check out [ THIS GUIDE ]. The location (somewhere in the Tokyo Metropolitan Area) and time will be printed on the ticket included in the album. There is no limit to the number of albums a single person can buy; the only requirement to be able to purchase it is that you be a Fan Club member (guide to joining). If this delectable version is too fancy for you, refer back to this post and this post for information about the regular physical and digital copies! If you intend to buy physical copies of the new BEST OF albums (see this entry for more details), they are now available for preorder on CDJapan (kachou no shirabe / fuugetsu no uta), and I would assume any other online store you normally use (HMV, amazon... etc). The albums contain 10 and 11 tracks, respectively, and are CD-only. Album art is yet to be revealed! If you don't intend to order a physical copy, you will be able to buy/stream the albums via Spotify, itunes, or apple music. Once again, it'll be released on the 24th of April 2019, so look forward to it! YOU RECEIVE MORE THAN YOU GIVE. May or may not be answered here. And always the clear reality is something cruel. We invited you to our castle. To you, our comrades, who walk together with us. We do not know what will happen next. There might not be a tomorrow. Come on, the new dawn of A9 is starting. Everything in uppercase was already written in English, and as graphicabyss on Tumblr pointed out, they're actually quotes from Antoine de Saint-Exupéry. It's unusual, to begin with, to have a message like this in a pamphlet, and we know by now that for ALICE IN CASTLE they incorporated theatre into the live... But was that really the end of the story? They have recently announced the sale date for the new pair of Best Of albums (all songs have been re-arranged and re-recorded), along with the name of each album, and their classy new look. They're going to be doing a big summer tour in support of the albums, with the tour final being on the 10th of August 2019 (Info on OHP). But for now, get excited about that set of albums! They've confirmed that they will be available on itunes, Apple Music, and their Spotify page, so if you can't pick up the physical copy in an online retailer like CD Japan, Tower Records, Amazon, or HMV, please support them through one of the digital/streaming options above! - Originally they were gunning to remake the NUMBER SIX. MV, but as of yet, there is no word on whether there will be a new MV accompanying either album. - Show has started a new project on his VIP salon, of writing short stories to go with his lyrics (then narrating them himself! ), and so far he has done one for TIME MACHINE... he has recently said he's working on the next story -- join his VIP salon to read/listen! Let the 15th Anniversary celebration begin! Sales ! Selling some old merchandise, please check it out !